If you're into high-end vinyl, then these discs are for you. The mastering duties for each of these titles were undertaken by Chris Bellman, of Bernie Grundman Mastering. Bellman, who mastered Neil Young's Greatest Hits vinyl, as well as each of the live Performance Series titles for vinyl, is by now well acquainted with Young's work, and was a natural choice for this undertaking. He went back to the original analog master tapes for each title. The 140 gram vinyl was pressed at the Pallas facility in Germany, which is well known for producing ultra-premium vinyl pressings that are flat, clean, and are virtually silent during playback. While all of the vinyl I've seen recently from Pallas has been of the 180 gram variety, they've pressed 140 gram regular weight vinyl for each of these four titles, which is reflected in a list price for these reissues of roughly ten dollars less than the typical Pallas 180 gram release. Fortunately, despite the less than premium price, Warner did not skimp on the packaging. The gatefold covers are made of heavy cardstock and are faithful to the originals, down to the original inserts. Curiously, Harvest carries an additional ten dollar premium, presumably because of the textured cardboard cover and insert. The 140 gram vinyl is housed in plain paper sleeves, a departure from the poly-lined paper inners typically used by Pallas for their 180 gram offerings. So why should you care? BECAUSE SOUND MATTERS! Still uncertain? 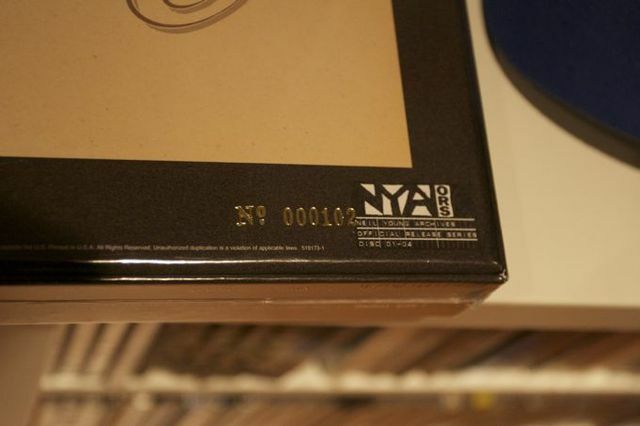 Then take a look at this promo video of Vinyl Boxset of NY Original Recording Series. Maybe that'll change your mind. ps - we always considered ourselves a bit of a vinyl connoisseur. Until these came along and we have no idea how much our regular vinyls weigh, much less why we would need 180 vs 140 grams? Can 40 grams really sound different? Having said that we must admit how truly amazed were at the sound quality difference between the DVD and BluRay versions of NYA. UPDATE: Also, see Anatomy of Neil Young Vinyl Series - Chapter 2: Pressing and Chapter1: Anatomy of a LP Box Set - Neil Young Official Release Series 1-4. I just hope the next 4 come out on cd before Archives vol.2. Still waiting for this set up in Toronto. Anyone north of the border receive theirs yet? Ya, I was shocked. I got the box set on the 25th, one day after release, in toronto. It's amazing. I got number 104. One can only keep hoping, wishing and praying for the next four...lol...my vinyls were all second hand when I got them and Ihave doubly worn them out! 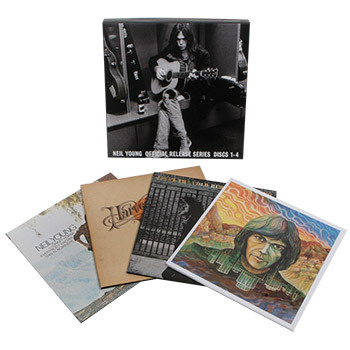 If you are ANYTHING of a Neil Young fan I CAN'T RECOMMEND THIS SET ENOUGH!!!!!! I can't really hear the difference in sound or anything. I just want to get these because they've been released and I have to have every single Neil release, even if I already have the albums in som eother format. Because that way people are more impressed with my collection and I can claim that I'm Neil's biggest fan. Which I am. Uh, yeah... This is amazing. Mine came today. I've only had a chance to list to s/t but wow... I was blown away by the Archives sound but this is even warmer. Just amazing... I got 188/3000. I reckon we will see Homegrown as part of the SE series of the Archive releases. I just hope we get the original Tonight's the Night at some point! Just got mine today - #000567. If you have a decent turntable, you need to splurge and buy this for yourself. Holy crap. Through the first two discs, and powering through the next two tonight. The amount of sonic space is just amazing; it really feels like you're in the studio. The s/t album is astonishing. A true Young-Nietsche collaboration that has never been accurately assessed. And as many times as I've listened to DBTR/CITS, etc, I can't believe how much is here. You can listen to Neil or Danny or Ralph or Billy individually like never before. The DVD-Stereo and Blu-Ray have come close, but this one wins. I got mine last on the 27! I have yet to open it, I am waiting for my new turntable. Hey!!!! this is my box up there on the picture! I have copy #119, and evrything is perfect, except that the gold foil numbers can easily 'wipe off' the backs of the lps(I accidentally ran a finger over one and half the gold disappeared!). Still haven't rec'd my gold cds yet. Yes, it's true, Neil Young has proved it again! Vinyl is the real thing. The sound is amazing. Great albums in a great package. And no, I am not a vinyl junkie but simply a music lover. It's so wonderful to listen to these remastered albums in such a superb way. It was fun to listen to the remastered cd's for a while. Specially the Neill Young album turned out to be a lost classic. And now 180 grams black gold. Thank you Neil and everyone on the Shakey train. Shame as I am a big vinyl junkie, huge Neil Young fan but 16 and living in the UK. There's no way I can afford this set especially with the customs charges that will come with buying it. i-tunes gift cards, Neil Youngs record company plans on releasing all of the archives on I-tunes??? Anyone heard this before..is it not already on I-tunes. I'm a huge NY fan and have every release on vinyl. I won't be buying these as I already have the originals which still sound great to me. I have a mid range turntable (Rega P3) and just can't justify buying something to stick on a shelf. I'm just not into this duplicating old releases if nothing new is added in terms of material. Stunning in quality and sound! I'm going to throw away my old copies of these albums. I just played the first album "Neil Young" in the set. Dead silent surface noise and a nice fat and detailed sound. The LP is heavy and perfectly flat. My turntable is not a super high end model and these still sound better than any CD of these recordings that I have. LRR: If you want a full comparison of these new reissues to the original vinyl, read the review at Myvinylreview.com. ordered mine on 11/29 from because sound matters. i had to wait till my bank account was right. anyway, it's 12/6 and no shipping notice, not even a bill to the credit card i used. what gives? Warner definitely has some wonky shipping policies. I ordered mine two weeks ago, received it last week -- but Warner still hasn't changed my order status to "shipped". In fact, I have the box in my hands and my credit card has still yet to be charged. Weird. Same thing happened with the Archives. I just wish I could get some playable copies of all four LPs. Two of the albums are marred in noise and scrunch-like distortion. I'm hoping I can exchange the defects for functional pressings as opposed to send the whole thing back. Alright, so I'm confused by you people. Especially this GBTG character. Firstly, they were pressed at Pallas, in Germany, and not Dallas. The difference in quality of the 140 gram and the 180 gram LPs is indiscernible. Another thing to mention is that all newly pressed vinyl is considered "virgin vinyl". What really and truly counts in terms of the quality of an LP is where, how, and by whom it was mastered. A poorly mastered LP could be pressed on the most expensive of vinyls, and still sound like garbage. On the other hand an LP that was mastered very well could still sound superb on light weight vinyl, except this lighter weight record could be more prone to warping and bending over time. This is why heavier vinyl is more common amongst audiophiles; it will still last and sound great years from now. I own a really old copy of Everybody Knows This Is Nowhere, and in my opinion it sounds just as good as the 180gm reissue. It is extremely silent and not warped. However the copy of Neil Young is much better than my original. It all depends on the shape of the record. Just another something I wanted to vent.